I suppose remaining young is appealing to us all, even if I relished a little reaching 50 and allowing myself to be (more) cranky and temperamental. The author is a medical doctor, and his interests have taken him into the field anti ageing, or more specifically maintaining health rather than simply seeking cures for ailment and disease. In essence this book is the doctors wisdom on the anti ageing challenge, covering a multitude of issues from inflammation and nutrition, through to stress and brain health. Although the content is thorough, and by necessity technical in places, the author manages to pitch the right balance between detail and clarity, and this results in a readable, if long, work, covering many areas. For me, the suggestions were almost overwhelming- maybe it’s a case of looking honestly at a handful which are of most personal relevance, rather than trying to do too much. 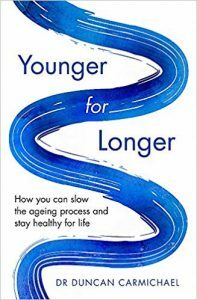 For anyone interested in anti ageing, in promoting health span as well as life span, or generally interested in health wellbeing and the human body, this is a worthwhile read.